Recent times have been busy for Evol Intent; between their solo aliases, touring, giving away tasty freebies and some big collabs with the likes of Noisia, it’s been a great year for the stateside trio. We thought it was high time for a chat, and Gigantor kindly agreed! Read on for his thoughts on free music, the “EDM” bubble and more. Lockjaw continues his run of excellent releases with another single for London-based Lifestyle Recordings. Idol ramps up the atmosphere on the intro before dropping into a hefty beat punctuated by soft, ethereal vocals and eerie synth screams; the duality of the fearsome beat and the soft pads gives the tune a really interesting energy, and little touches like the guitar in the second half of the tune really give this one character. Cold In The Middle hits down heavy once again with a scattershot drum workout set to deep, ominous bass tones. Once again melodic elements are put to great use on the intro and breakdown, providing a contrast before the meatier elements steal the show. This one’s out now exclusively at Juno with full release to follow from August 4th. Check out the clips below and grab it at your leisure. Symmetry Recordings return with a fresh double A side from label regulars Break and Fields. Break goes in on the A side with the rolling charms of Duck For Cover, focusing on groove over the hyperactivity that much of modern Techstep embraces. Hypnotic vibes and tons of atmosphere. Over on the flip Fields presents his first solo outing for the label with an unusual beat structure, chunky bass textures and tons of little details sprinkled into the mix. This one’s all in the percussion, with bongos punctuating a shuffling, cymbal heavy drum workout. Check out the clips below and grab this one from the Symmetry Store now. Before Lifted Music and before the height of his fame, one of Spor’s first big breaks came on the Tactics EP for Renegade Hardware in 2005. 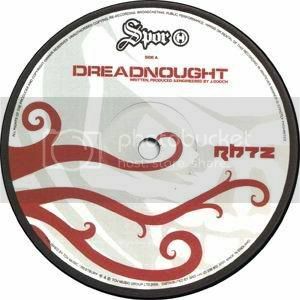 The lead track from that EP, Dreadnought, still packs just as much of a punch nearly a decade on. The robotic FX and monstrous warped basslines give the tune both character and energy, and the detail in the production is incredible. Every element of the tune sits perfectly, and the result is a dancefloor weapon complete with a cheeky tempo drop for a breakbeat breakdown. Dreadnought was a taste of what was to come from a producer who’s presence in the scene is very much missed since his departure to lower tempos under his Feed Me alias. Check out the tune below and relive the past glory. Samurai make an unusual break from their vinyl releases to bring us a retrospective digital release of the previously vinyl-only Horo series. In order to stay true to the series (and presumably avoid angering the vinyl collectors who’ve spent a significant amount of cash collecting the original releases), the new digital compilation only features one track from each of the 12″s; the rest will remain vinyl exclusives. As fans of the label’s output will expect, the tracks on show are deep, dark and experimental, pushing the boundaries of what D&B is or should be. ASC’s contributions prove varied and excellent as usual, bringing together lush deep-techno and ambient influences with his unusual percussive elements. Other highlights come from Synkro’s Kiyoko alias on the lush downtempo ambience of Track 3 and from Clarity & Overlook on the ominous and angular Rohypnol. Honestly though picking favourites is tough; every track on here is more than worthy of your time and attention. The limited edition CD being offered has already sold out, but you can still snap up the digital bundle direct from the brand new Samurai web store. Check out the clips below and grab the release now. The ever prolific Ukrainian producer Fade has had a pretty big year with a slew of releases across a bunch of labels. His latest venture sees him releasing a full album of collaborations on his own Faded Music imprint, and the quality remains as high as ever. We thought it was high time we caught the man for a quick Q&A, so read on for Fade’s thoughts on all things D&B. DNB Dojo: It’s been a pretty busy year for you with releases on DSCI4, 117, Avantgarde, Grindhou5e, and of course your own Faded Music imprint. Have you got any particular highlights? How do you decide what music to send out to other labels and what gets released on your own? Fade: Yes, I have been producing a lot of music lately and I’m happy to see it released. The main reason for creating Faded Music is that I had so much good unreleased music, that hadn’t got attention from other labels. So if I really feeling track and it’s not been signed anywhere I put it out on Faded Music. DD: The collaboration LP you’re dropping soon features a massive array of different artists, some better known than others. How did the different tunes come about? Who was your favourite producer to collaborate with? F: That was idea to collect together artists that I find interesting with different tunes, different moods. All that stuff has been produced in different times, but I can say that we worked on this compilation for around a year and I am really happy with the results. I think my favourite collab partner is Peter NC-17. Making collabs with him is always fun. We just finished one track and are working on a couple more. DD: On the subject of collaborations, if you could pick any artist living or dead to work with, who would it be? F: Hard to say…if I had to choose someone from current bass scene it would definitely be Noisia. From other music I’d pick Cypress Hill. DD: Living in Ukraine the recent political turmoil must have been difficult. Is it hard to make music under those circumstances, or do you draw inspiration from what’s going on around you? F: I’d not say that it’s difficult. Let’s say true. War between Ukraine and Russia is really horrible, a few hundred kilometres away every day people are dying. This year is the hardest in the history of our country. And for sure it’s hard to think about music, but when you are living in such a stressful situation for more than half a year, you start to learn how to abstract and music is one of the ways to not dip into depression. DD: What’s on the agenda for the rest of 2014? F: I have got some releases coming on labels such as DSCI4, Beta Recordings, Different and Alphacut. F: I wanna say big ups to those artists who been involved to this project. Abiotic, Nitri, Heavy1, NotioN, Fathom Audio, Meth, 2SHY, Dess. Thanks to James for PR works, my wife Julia for amazing artwork. And all listeners for supporting our label! You can check out clips of the LP below; watch out for it dropping at all good digital stores from July 28th. As we approach the July 27th release date gradually the good folk at Shogun Audio are revealing more and more of the new Technimatic album, and it’s shaping up to be well worth a look for fans of the melodic end of the genre. From the super mellow Music is Music and the interesting rhythms of Perseverance to the more dancefloor friendly stylings of Beneath The Skies and Tectonic, it’s difficult to argue with the quality of the tracks on show so far. My pick of the bunch has to be the insistent yet understated piano and crisp breaks of Looking For Diversion, featuring the delicate vocal talents of Lucy Kitchen, but there are plenty of other highlights too including the drumfunk workout of Lost Times and the downtempo funk of Mucky Jeff. Check out the clips below and watch out for the album dropping very soon on vinyl and digital. Whatson returns to Default Recordings with a pair of deeper rollers for those who like their D&B a little on the unusual side. Out In The Dark plays about with detuned synths on the intro, ignoring the usual rules about what might be considered “in tune” to interesting effect. Once the main verse hits though it’s down to business, with warm bass and rolling breaks keeping the track moving nicely. Live Today keeps the vibe rolling but notches back the energy slightly for a slightly deeper vibe, bringing bleepy melodies and soft, organ-like synths to bear nicely. There are some great little sonic touches in the mix which bring the tune to live; as ever it’s all in the detail. Check out the beats below and grab this from your favourite digital store now. The tenth installment in our exclusive mix series comes from Estonian producer Bone. Fresh from his new release for Authentic music, Bone delivers a diverse selection of D&B starting with deep liquid and building up to a clattering neurofunk finish; the likes of Calibre, Dub Phizix, Aeph and Noisia all make appearances alongside Bone’s own productions including some as yet unreleased dubs. Check it out via Mixcloud below or head to Hearthis.at for streaming and Dropbox for a download.